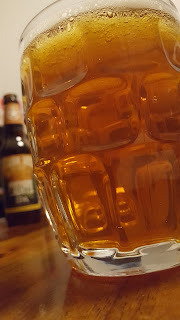 I am going to make an assumption with this post, namely that you have been reading Fuggled for a while and thus it will come as no surprise to you that I am a devotee of lager. There is just something about most lager styles that I find appealing, given a choice between some trendy glitter bomb juicy IPA and a pint of Miller Lite, I am likely to take the Miller Lite more often than not. When Mrs V and I made the move from Prague to central Virginia we knew that finding a good local lager was high on our list of priorities. 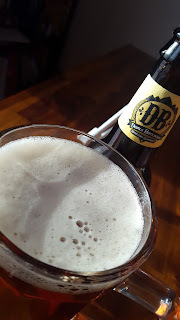 For a while we bounced around Blue Mountain's Classic Lager, Starr Hill's Jomo Lager, and the beer that is today's Old Friend, Devils Backbone Vienna Lager. Eventually Vienna Lager won the day and became my standard lager in the fridge. I really can't think why I stopped keeping a six pack of it in the fridge, probably something to do with the well made contract brewed lagers that I could buy at Trader Joe's. Being a central European style lager, it seemed only right to pour it into my half litre mug from the lovely Purkmistr in Plzeň that I got at the first Slunce ve Skle festival a decade ago. What a glorious deep copper beer with orange edges and half inch of off-white head that leaves a fine tracery of lacing down the glass. I had forgotten just how much I loved the aroma of Vienna Lager, laden with a smell that I can only describe as like large amounts of honey spread on freshly toasted bread. Floating around in the background is a lovely floral hoppiness that reminded me of walking in the Czech mountains in the height of summer, side note I have always loved the Czech word for flowers, 'kytičky'. Anyway, before I lapse into a Bohemian revelry, we should actually drink the beer, that is after all the whole point of this most wonderful of liquids. Teacakes, that's what I get, teacakes freshly taken out of the oven, spread with more honey, and then snaffled with all the delight of an illicit, though simple, pleasure. There is a light citrusy bitterness to the beer that gives the beer a balance that makes it thoroughly moreish. That thing I mentioned earlier about there being something about most lagers that I find appealing, it is the clean bite that comes with a well made, properly lagered beer. The best way I can think of to describe the perception I am thinking of is that it is a tight snap that leaves the palate waiting for more. Drinkability, that is ultimately what love about lager styles, I find them more drinkable than many of their top fermented cousins. 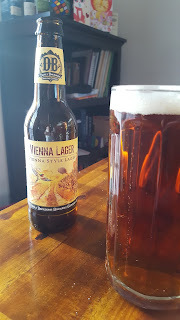 With it being Friday, I might just swing by the shop and pick up a 6 pack of Vienna Lager to enjoy this evening once the boys have gone down for the night...every prospect pleases. There was sad news this morning when I opened Facebook. Dave Bailey, once of the Woolpack Inn and more recently of Hardknott Brewing has decided to call it a day with the brewery. In Dave's post he cites the saturation of the craft beer market in the UK as one reason for deciding to close down. By the sound of it, the market is exceptionally tight for small brewers without their own tied estate to guarantee a route to market. That coupled with the parsimony of some real ale drinkers can only make life very challenging. I am not sure if Dave's beers made it to this side of the Pond but I am confident they would have been well received here. When I was home in 2014, I made a point to try as many as I could lay hands on, and thoroughly enjoyed them all. I want to wish Dave all the best in whatever comes next and sincerely hope he remains involved in beer as it would be a shame to lose his knowledge, passion, and drive from the industry. Many moons ago, when Fuggled was in its infancy, Mrs Velkyal and I were still living in Prague, and a night out on the lash didn't cost me an arm and leg, a friend brought me a bottle of beer from a brewery called Starr Hill. The beer in question was simply called Pale Ale, and I wrote about it here. 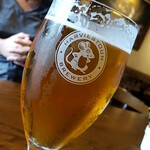 Fast forward a few months and Mrs V and I had made the transition across the Pond, a night out on the lash cost me an arm and a leg, and I was working for the very same Starr Hill Brewery, spending my weekends behind the bar at their tasting room. 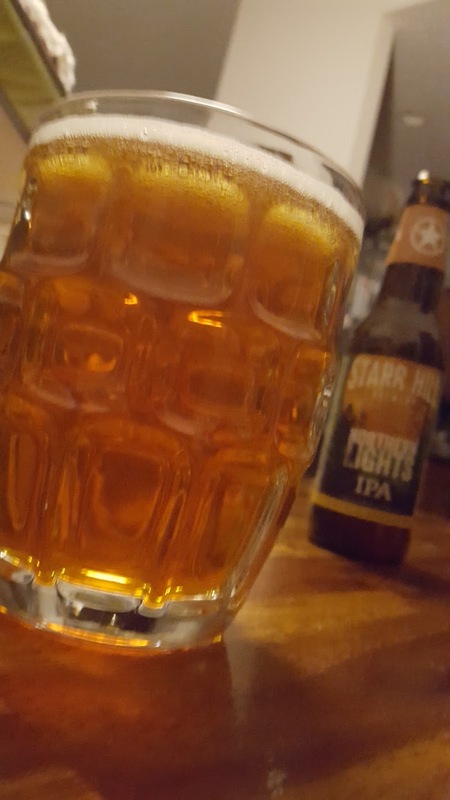 I have to admit to almost reveling in an IPA that poured as beautifully clear as Northern Lights, a light copper liquid topped with a good half inch of white foam that lingered resolutely and left a delicate lacing down the sides of the glass. The aroma was classic American style IPA, redolent with pine resin, positively dripping with grapefruit, and just a hint of herbal dankness in the background, it was like time travel. Tastewise the citrus and pine flavours from the hops where upfront and centre, but being an East Coast IPA there was a sweet toffee note that lent an element of balance. Being a more old school IPA, the bitterness was very much there, firm, bracing, and everything a bitter beer should be, lovers of NEIPA need not apply here for sure. With each mouthful, and a quick 4oz top up on the 20oz pint glass, the bitterness built, like the layers of hand dipped candles. With an ABV of 5.3%, Northern Lights isn't going to knock you on your arse, but the booze is well integrated and doesn't detract from the interplay of hop bitterness and malt sweetness. 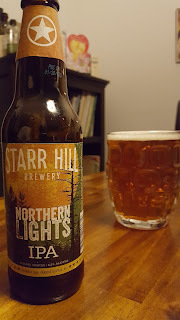 Northern Lights is an old school East Coast IPA, but in a good way, a bracingly bitter beer that deserves revisiting by many.